In the end I decided to go for the double Chelsea defence and take out the risk of Jimenez and the FA Cup for Batshuayi. Rather than go double Palace attack I went with the double Chelsea defence. Hudson Odoi had to go under the 3 Chelsea player rule and so McDonald seemed the least worst option. 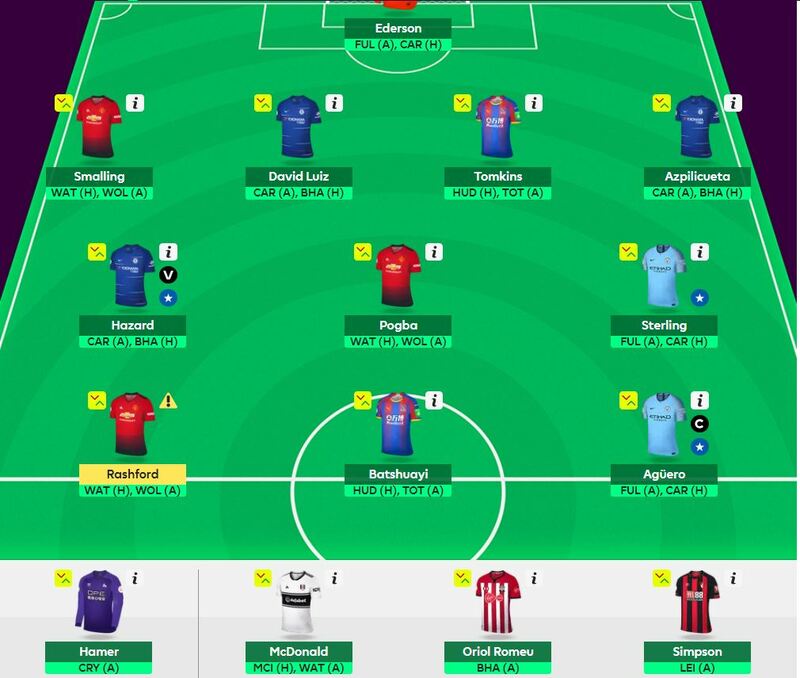 It means I’m all in on Rashford with no real alternative if he is injured as my bench is now woefully thin. I also couldn’t afford Schlupp so I’ve stuck with Tomkins and hope he can do something from a set piece. Some late news coming out that Tomkins might not start. But Andrew rumours that Lindelof didn’t travel? Damn… Lindelof didnt travel? I’m just too late to change now then!!!! And even at this early stage, I feel my FH team is going to be very disappointing. No Lindelof, so a clean sheet at a minimum missed. Went with D. Silva instead if B. Silva as my 3rd city attacker. Chose the wrong Palace players with Van Aanholt, Milivojevic and Zaha returning with no return from Schlupp or Batshuayi bar the clean sheet. Looking at a red arrow after today for sure. Ok scratch the United clean sheet so that’s a bit of respite..
Ian, identical for me. Kent, your post stopped me changing Lindelof to Shaw!! My own fault. Had B.Silva in until Friday, replaced him with D.Silva. My week 31 team would’ve done better cos guess what? Leicester at last got a clean sheet, and Vardy scored. Will Lindelof play Tuesday? I wouldnt be confident of Lindelof playing Tuesday. I only dropped 3 places in OR so not as bad as I feared. I dont think a lot of teams had Van Aanholt, Mili, Guaita or Shaw. I felt cheated by Lindelöf’s post on the official Man Utd site too. Sigh. Still managed to get green arrow to 11k OR for now though. Hopefully more green arrow from my CHE & TOT players later. I dropped from 5882 to 5883! Today was even worse though. Azpilicueta scoring was bad news, I had Luiz. Though guess what? If I’d had BSilva instead of DSilva it’s Azpilicueta I’d have had. Cost me 20 points. Big drop coming.